If you've never done any leatherworking before and want to try your hand at sheathmaking, consider starting with a Leather Sheath or Pouch Kit. Available in a couple of sizes, they may not fit every knife out there, but there are a great introduction to leatherworking. Basic in nature and easy to make, they can also be dressed up and modified to be a true work of art that you can be proud of. Lot of room for creativity here! Pretty complete kit includes the precut leather ( Surprisingly nice 8 to 9 oz. weight) , strap with pre-installed snap, stitching thread and needle, rivet, suggestions for decorative tooling, and directions. Embossing leather is a real art and I could do a whole separate tutorial on it ( after I learn how, of course). For now, I'm simply going to show you how to do a simple diamond pattern. I found a piece of gutter guard mesh that has a nice diamond pattern and cut it to the approximate size of the area of the sheath to be embossed. Gutter guard mesh is cheap--a three foot piece cost me a buck. I freehand draw an outlined border with a fine line roller ball pen. The diamond pattern will stay inside this outline. Lay the metal mesh on top of the wet leather and trace the inside of the diamond patterns with a fine roller ball pen. 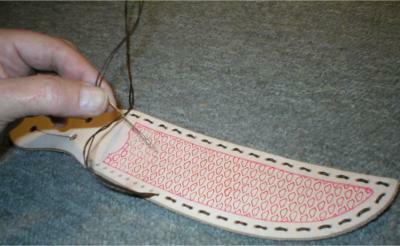 Press hard to indent the leather and stay inside the outlined border. OK, this is what it should look like when you're done. Pseudo-snakeskin? I used a red roller ball so the dye I choose would cover the color easily. Start stitching the front and back together following kit instructions. Use a figure 8 stitch, following through from the first hole to the last, reversing and going back with stitches all the way to the hole where you started. Click here to see what a figure 8 stitch looks like. You might want to take note that they give you absolutely no extra stitching thread, so you have to watch what you're doing. 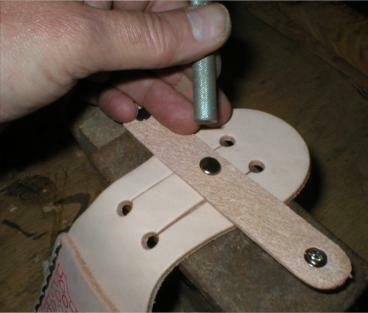 Use the included rivet and your own rivet setter to attach the strap with the snap on it. The snap is already mounted so that simplify this step ( especially if you're like me and have trouble setting snaps). 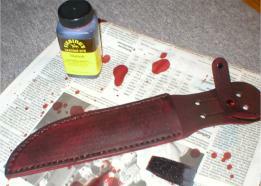 Now it's really starting to look like something: I use a small foam brush to color the sheath with a leather dye. I used maroon this time but there are a rainbow of colors available. Be careful with leather dye: if you get it on your hands or, it'll be there for a week. On carpets, it'll be there forever. And this is what it should look like when complete. Leather stamping or engraving is a way to really dress up your work but is a specialized art that has special tools and would require a whole book to explain in detail. A good, inexpensive book to start with is The ABC's of Leatherwork. Another easy way to really dress up your sheath is with inserts. Cut out the center of the front part of the sheath to expose a more decorative leather ( or naugahyde, vinyl, whatever) which will be sandwiched in your new creation. Stitch as above.